Vyse uvedene souradnice Vas opet privedou k budove, ve ktere sidli jeden z pocitacovych gigantu. Tato firma se v teto oblasti etablovala skutecne davno, je jednim z "dinosauru" oboru IT a stoji za radou velkych inovaci v minulem stoleti. Firma byla oficialne zalozena 15. cervna 1911, tehdy pod jmenem Computing- Tabulating- Recording Company (C-T-R), jeji koreny vsak sahaji az do roku 1888. V roce 1914 se jejim generalnim manazerem stal legendarni Thomas J. Watson, 14. unora 1924 doslo k prejmenovani na International Business Machines Corporation, zkracene IBM. POZOR: Cache na techto souradnicich nenajdete!! Firma IBM ma na svedomi i jeden z nejpouzivanejsich a nejrozsirenejsich programovacich jazyku - Fortran. Jeho jmeno vzniklo z dlouheho nazvu The IBM Mathematical Formula Translating System a byl vytvoren jako jeden z prvnich vysokourovnovych a obecnych jazyku v letech 1954 az 1957 v laboratorich IBM tymem, ktery vedl John W. Backus. Fortran mel obrovsky uspech a okamzite se zacal prosazovat v oblastech, pro ktere byl primarne urcen: v numerickych vypoctech, ve vedeckotechnicke oblasti a dalsich na vypocty velmi narocnych oborech: v modelovani pocasi, dynamice kapalin, chemii, jaderne fyzice a podobne. V tomto programovacim jazyku vzniklo obrovske mnozstvi aplikaci, ktere se dodnes siroce vyuzivaji, a i kdyz byl v devadesatych letech trochu zastinen nekterymi jinymi jazyky, stale existuji oblasti, ve kterych je Fortran nezastupitelny a jeho role je naprosto dominantni. Fortran dominoval zejmena od sedesatych do devadesatych let. V osmdesatych letech vzniklo i sebevedome prohlaseni: "Nejsem si uplne jisty, jak bude vypadat programovaci jazyk pro vedecko-technicke vypocty v 21. stoleti, ale zcela urcite se bude jmenovat Fortran" . Ve Fortranu byly mimo jine vytvoreny i programy pro vetsinu vesmirnych letu. A prave zde se vyskytla dosud nejdrazsi programatorska chyba na svete. Dne 28. cervence 1962 doslo chvili po startu k havarii nosne rakety se sondou Mariner, ktera mela letet k Venusi. Raketa se odchylila od sve drahy a zritila se do Atlantiku. Usilovne patrani po pricinach selhani vedlo k sokujicimu vysledku - mohla za to zamena carky za tecku! Fortran ma totiz nekolik zvlastnich vlastnosti: ignoruje mezery a nevyzaduje predem deklaraci promennych. Programator zadal v prikazu cyklu misto spravneho DO 17 I=1,10 chybne DO 17 I=1.10, coz vsak prekladac misto cyklu vyhodnotil jako prirazeni hodnoty 1.10 do nove promenne DO17I. Tato drobna chyba znamenala skodu zhruba 10 milionu dolaru! Doufam, ze Vy podobnou chybu neudelate a ze se s nasledujicim kratkym programem ve Fortranu vyrovnate bez problemu. Hodne stesti pri programovani i hledani! Pozor - jedna se o skutecnou mikrocache, ktera obsahuje pouze logbook - prineste si proto vlastni tuzku a v logu setrete mistem - staci napsat pouze nick a datum. Cache ulozte na sve misto presne tak, jak byla predtim. Diky!!! PS: Za spolupraci a betatest patri velky dik matymu ! The above coordinates will bring you to yet another building in Prague used by one of the biggest computer company in the world. This company is quite old, it is one of the "dinosaurus" of IT industry and it brought a lot of innovations to it in the last century. The company was officially established on 15th June 1911 as the Computing- Tabulating- Recording Company (C-T-R), its origins can be traced back to the 1888. In 1914 the legenday Thomas J. Watson became a general manager. On 14th February 1924, C-T-R's name was formally changed to International Business Machines Corporation - IBM for short. ATTENTION: There is no cache at those coordinates!! IBM stays behind the one of the most widely used programming languages - Fortran. Its name is derived from quite long sentence The IBM Mathematical Formula Translating System, the language was created as one of the first high level and general programming languages in the years 1954 - 1957 in the IBM laboratories by the large team of specialists lead by John W. Backus. 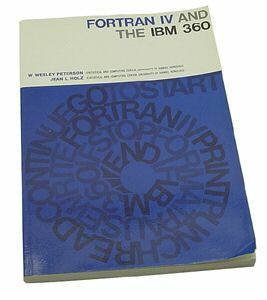 Fortran had a great success and immediately started to dominate in the fields which fit into its primary purpose: in numeric computation, in scientific computing, in climate modelling, fluid dynamics, chemistry, nuclear physics et cetera. Many applications are still widely used and although some other languages supersed it in the nineties, there are still many areas in which Fortran is dominant till today. In the eighties the following interesting statement has been made: "I am not certain what the language for scientific and engineering computation will look like by the 21st century, but I am sure it will be called Fortran" . 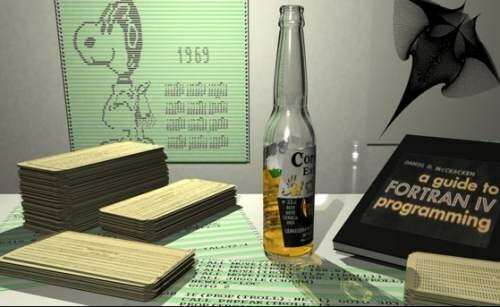 Fortran was also used for creating the critical applications in most important space programs. And this is the field where the most expensive programming error in history has been made. On 28. July 1962 the Mariner spacecraft failed during its launch and crashed into the Atlantic ocean. The searching for the cause brought very surprising discovery - the reason was the period typed in place of a comma! Fortran has several strange features: it ignores the spaces and does not require the special variable declaration. The programmer made an error in the cycle command. Instead of the correct DO 17 I=1,10 he typed the wrong DO 17 I=1.10 command, which has been translated as a setting the value 1.10 to the new variable DO17I instead of the cycle command. This subtle error caused the damage of about 10 millions of dollars! I hope you will avoid such errors and you will be able to get the coordinates from the above program without any problem. Good luck! Attention - this is a real microcache which contains only the logbook. You need to bring your own pen! Also please save the space in the logbook, please put only the date and nick there. Please put the cache exactly at the same place as it was before. Thanks!!! PS: My thanks for cooperation and betatest goes to maty ! wnxn wr sverzav onein? / jung vf gur pbzcnal pbybe?